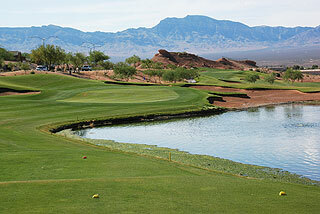 The Oasis Golf Club is located 80 miles from the Las Vegas strip in Mesquite, NV. 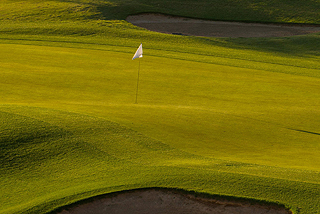 The Arnold Palmer designed "Palmer Course" and David Druzisky designed "Canyons Course" is home to Mesquite's only 36-hole facility. 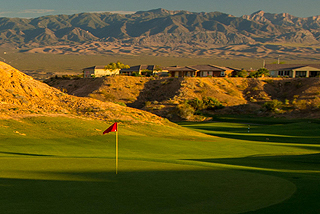 The master planned Mesquite Vistas property is also home to Mesquite's largest clubhouse which includes a grille room, "members only" bar & restaurant, member's lounge, locker rooms and a magnificent patio view of the Virgin mountain range. Each course features outstanding conditioning from tee to green, and is well marked with sprinkler heads about the course and yardage blocks at 100,150 and 00 yards measured to the center of the green. Color coded flags indicate front, middle and back hole locations, which is important information to have on the large, sloping putting surfaces prominent on both layouts. 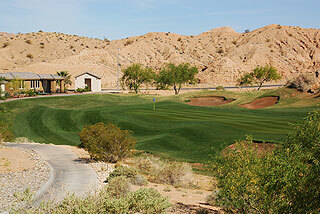 The Canyons course originally was built by David Drusisky as a 9-hole course aptly named the Vistas. 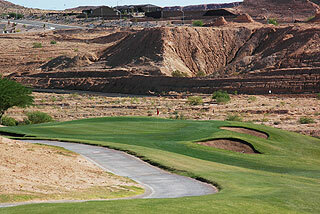 However in 2005, the front 9 was added and renamed the Canyons course. The front 9 shares many characteristics of the Palmer course with several elevation drops from tee to fairway and/or green. 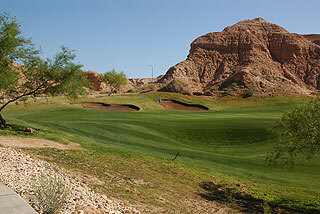 The Canyons is rated more difficult than the Palmer due to its length, however its forgiving, wider fairways allows players of all levels to bomb away. There are four sets of tees on the Canyons, playing to distances and slopes measuring between 6403 yards with a slope/rating of 138/71.5 and 4787 yards with a slope/rating of 115/67.8. Do not let the overall distance of this layout fool you. For the first time visitors not familiar with this layout, there are some serious pratfalls. 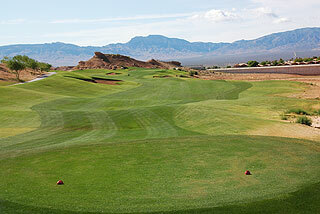 Once the preferred landing zones are recognized, this course is extremely rewarding and fun to play! Before the new nine was added to form the Canyons course, we found the former Vistas nine-hole layout to be one of our favorites in the Mesquite area. 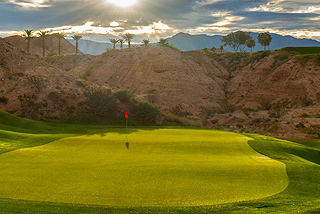 With the new back nine, the Canyons maintains the spirit created in the former Vistas. We highly recommend a round of golf here. As in all new courses, the back side needs to settle in a bit - but the layout is superior.